"A quote came out of the emails, these leaked emails, that said "let's use Mike's trick to hide the decline". That's the words, "let's use Mike's trick to hide the decline". Mike is Michael Mann, said "hey, trick just means mathematical trick. That's all." My response is I'm not worried about the word trick. I'm worried about the decline." "What they said is "how can we hide the decline?" And the suggestion came back from Phil Jones at the UK, "Let's use Mike's trick to hide the decline". Mike's trick consisted of erasing that data, calling it unreliable, and then substituting the temperature data from thereon." "I’ve just completed Mike’s Nature trick of adding in the real temps to each series for the last 20 years (ie from 1981 onwards) and from 1961 for Keith’s to hide the decline." It's clear that "Mike's Nature trick" is quite separate to Keith Briffa's "hide the decline". Muller has taken different sections of Phil Jone's emails and morphed them into a single phrase. To understand how this is a misleading characterisation, it's helpful to examine exactly what "Mike's Nature trick" and "hide the decline" refer to. What does "hide the decline" refer to? Phil Jones' email is often cited as evidence of an attempt to "hide the decline in global temperatures". This is incorrect. The decline actually refers to a decline in tree-ring density at certain high-latitude locations since 1960. However, Muller doesn't make this error - he clearly understands that global temperatures have been rising in recent decades as indicated by the instrumental record. Tree-ring growth has been found to match well with temperature, and hence tree-ring width and density is used to plot temperature going back hundreds of years. However, tree-rings in some high-latitude locations diverge from modern instrumental temperature records after 1960. This is known as the "divergence problem". Consequently, tree-ring data in these high-latitude locations are not considered reliable after 1960 and should not be used to represent temperature in recent decades. 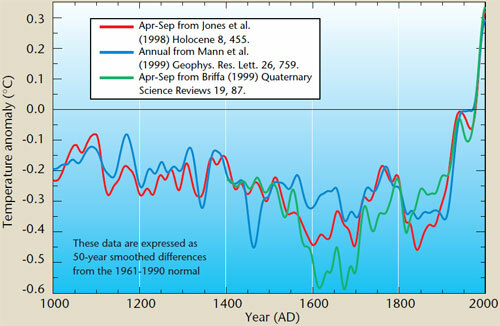 In Phil Jones' original email, he refers to a graph produced for the cover of a 2000 WMO report. Figure 1: Northern Hemisphere temperatures were reconstructed for the past 1000 years (up to 1999) using palaeoclimatic records (tree rings, corals, ice cores, lake sediments, etc. ), along with historical and long instrumental records (WMO 2000). To construct the green line, Jones took tree-ring density data from Annual climate variability in the Holocene: interpreting the message of ancient trees (Briffa 2000). Note - the reason the paper was eventually published in 2000, not 1999, was due to a publication delay. We can see the original tree-ring density data in the figure below, taken from Briffa 2000. The green line represents Low Frequency Density (LFD) and diverges from the instrumental temperature record (the thick black line), as noted by Briffa in the caption. Figure 2: An indication of growing season temperature changes across the whole of the northern boreal forest. The LFD curve indicates low-frequency density changes. Note the recent disparity in density and measured temperatures. In creating the WMO graph, Jones cut off the tree-ring density curve around 1960 when it diverged from instrumental temperature and grafted the instrumental temperature onto the green line. This technique has been rightly criticised for failing to distinguish between reconstructed temperature and the instrumental temperature in a graph. However, the decline in tree-ring density is not a hidden phenomena - it's been openly discussed in the peer-reviewed literature since 1995 (Jacoby 1995) and was also discussed in the IPCC Third Assessment Report (TAR) and Fourth Assessment Report (AR4). Lastly, it bears remembering that other research finds tree-ring density is reliable before 1960. Briffa 1998 finds that tree-ring width and density show close agreement with temperature back to 1880. The high-latitude tree-rings that show divergence after 1960 also match closely with other non-diverging proxies going back to the Medieval Warm Period (Cook 2004). This indicates the divergence problem is restricted to modern times. What is "Mike's Nature trick"? This refers to a technique (in other words, "trick of the trade") used in a paper published in the journal Nature by lead author Michael Mann (Mann et al 1998). The "trick" is the technique of plotting recent instrumental data along with the reconstructed data. This places recent global warming trends in the context of temperature changes over longer time scales. This graph is commonly known as the hockey stick. Figure 3: Northern Hemisphere mean temperature anomaly in °C (IPCC TAR). There is nothing secret about "Mike's trick". Both the instrumental (red) and reconstructed temperature (blue) are clearly labelled in Mann's 1998 Nature article, the follow-up Mann et al 1999 and the IPCC Third Assessment Report. A common and broadly held misconception is that Mann's hockey stick hides the decline. There is no "decline" in Mann's reconstructions. As we shall examine shortly, the source of "the decline" come from temperature reconstructions calculated from tree-ring density at high northern latitudes (Briffa 1998). There are very few of these in Mann's proxy data and hence his reconstructions never required removal of any declining tree-ring density. Thus it's clear that "Mike's Nature trick" has nothing to do with Briffa's "decline". There is no "decline" in Mann et al 1998 and Mann et al 1999. To conflate two separate techniques via the phrase "Mike's Nature trick to hide the decline" is adding to the glut of 'Climategate' misinformation.